Musically (despite VH having more #1 songs with Hagar as singer), would you prefer Van Halan with Roth or Hagar as lead singer? I was never a big fan of Van Halen, but their later albums wasn't too bad including VH last album with Roth titled 1984. 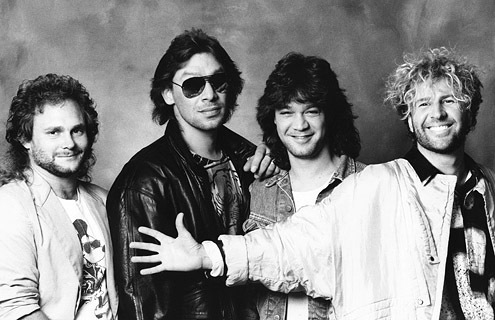 After Roth departure, Sammy Hagar joined Van Halen as lead singer and their first album together 5150 sound much more mature and refined than previous albums. Last edited by Smokey; 03-21-2014 at 07:55 PM. I like both versions of VH. Living in St. Louis I was well aware of Sammy and his solo career well before VH. Then I Can't Drive 55 really broke him out across the U.S. and put him on MTV. I thought VH having Sammy front the band was a wise move, much smarter than trying to find a Roth clone. Then when Dave put together his post VH band with Steve Vye and bassist Billy Sheen, I thought, wow, this is going to be interesting. I have all the VH with Roth and a couple Roth solo post VH albums. I also have several of Sammy's albums and 3 with him and VH. I think 5150 & OU812 are as strong as any VH albums of any period, although for me the 1st VH album will hold #1.. And, any Rock collection has a gaping hole without the Montrose, Rock The Nation album. When it comes to VH, I always preferred Gary Cherone. H i Kex, good to hear from you, don't be such a stranger. I'm sure Smokey appreciates you pointing out his over sight of such a spectacular period of VH, although very short, LOL. I'm sure Smokey appreciates you pointing out his over sight of such a spectacular period of VH, although very short, LOL. He sound alot like Sammy, with limited higher notes. Last edited by Smokey; 03-24-2014 at 12:09 AM. Roth is just silly............goofy............a dork ! Hagar is genetically engineered to be a rock singer. I'd have to see Hagar in a set of assless chaps in order to make this decision. JohnMichael and Mr Peabody like this. FA just confirmed my post. I don't know about that. I kinda like the way Roth is genetically engineered in that photo. So maybe he should have been a gymnast. My comment is in the context of a vocalist. Ann Wilson can sing a rock song as good as anyone that could take a breath but she wouldn't make much of a gymnast with assless chaps. so maybe he should have been a gymnast. I picked DLR - why? Cuz that's what I grew up with. Don't get me wrong, I love me some Hagar and was thrilled when I heard he was replacing DLR in VH, but was underwhelmed with the product. And years after the fact and all that harping and back-biting between both parties, I feel that Sammy is better off without VH and VH is better off with DLR. The Van Halen brothers were fortunate to have either one at any point in time.
" Money can't buy you happiness, but it can buy you a yacht big enough to pull up right alongside it."